It seems that all of us seem to have more intense workloads and having the actual time to bear down and actually get things done is a challenge. Some over-achievers take pride in telling others how hectic their schedules are, to the point where being busy is a status symbol for our over-scheduled society. Others feel fell guilt when lamenting on how busy they are, believing that complaining about it only minimizes the time of the others we are interacting with. It may be our collective imaginations but the cascade of information that is hurled at us in the course of a day from the multiple media sources we are exposed to is immense compared to ten or even five years ago. Take the accelerated work pace that all of us face, combined with daily onslaughts of email messages and internet diversions and it’s no wonder that there is a desire for all of us to get us refocused by someone or something. With these additional distractions as a backdrop, it’s hard to imagine a book that could improve on the tried and true concept of a “to-do” list. That long tested time management concept of “listing your work and working your list” is still practiced by most of us in one way, shape or form. 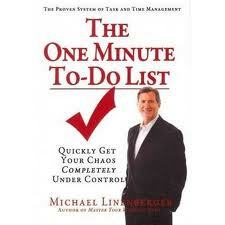 Michael Linenberger and his latest book The One Minute To-Do List is that person and the book. Prior to One Minute To-Do List (which the author acronyms into 1mtdl), Linenberger wrote other time management books including the popular Master Your Workday Now and Total Workday Control Using Microsoft Outlook. The secret of Linenberger’s success is that he never gets too complicated and that is what makes this book work. Linenberger quickly classifies to-do lists into three basic categories: Critical Now, Opportunity Now, and Over the Horizon. Critical Now includes tasks that are absolutely due today. It is essential that these are at the top of your mind and not cluttered by the other two categories. Opportunity Now are items that aren’t as urgent as Critical Now tasks but you would work on now if you had the chance or opportunity. Our Over-the –Horizon List are tasks that require ten days or more to accomplish and will become urgent later on. If everything is important than we get bogged down and nothing is accomplished. Linenberger cuts to the chase with 114 pages of rapid fire advice that one can easily read in one sitting. When it’s all consumed the One Minute To-Do List is a quick, effective way to calibrate your time management skills without a time consuming overhaul. In other words, Linenberger is not asking readers to reinvent the wheel but instead use easy to follow, common sense techniques that are worth the minimal investment of what all of us value most – time. Will it work for you over the long haul, who knows? Regardless, Linenberger’s methods utilized even in a piece-meal fashion are worth adding to your time management regimen. Add his integration of Microsoft Outlook and newly developed android phone applications like Toodledo to and one can take the science of writing a to-do list to a whole new level. Now, what was I doing? Chris Wendel is a consultant and lender with Northern Initiative in Traverse City. Northern Initiatives is a private, non-profit community development corporation that provides entrepreneurs with access to capital, information, and new markets.